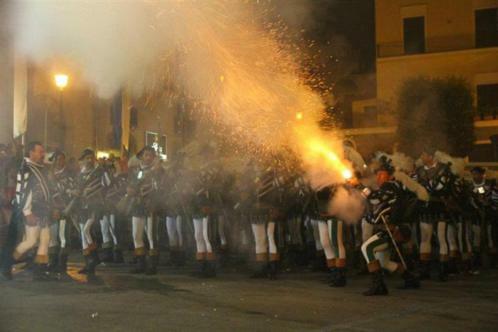 The choreography of the group is studied and adapted to the event and to the place where it will be made. 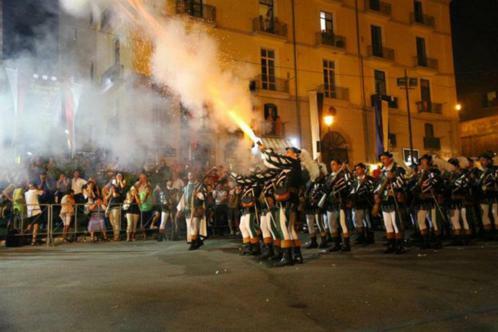 It is possible to obtain the major results along the roads and the squares, especially in the field related to the Palio and the historical or religious parades: showing in wide areas is not a binding requirement thanks to the majestic organization of the show. 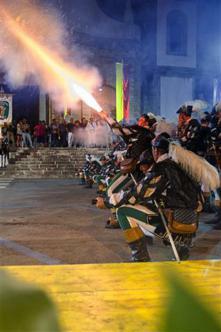 The historical background of the event guides the customization of the show; it is also possible to line up different groups in order to recall different ranks clashing in battles. 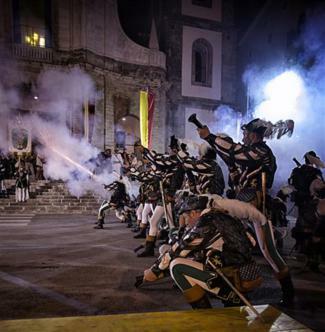 The presence of a castle or an ancient stronghold represents the occasion to perform an amazing “Castle Siege”, where the varied groups compete with the dominion of the city through a set of firing blanks, shot from the walls and at the base of the castle. 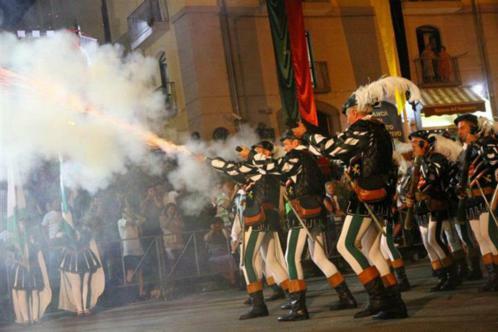 The show consists of several moments: the shot of the Pistonieri, the accompaniment of the Drummers, the choreographies and the synchronous movements of the Banners/Pikes. The armed company is proud of its technical qualities and its manageability of the ancient muzzleloading “Pistone”. 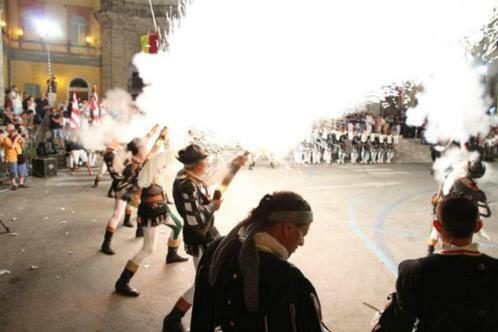 Each member is equipped with an appropriate technical-ballistic research, proving the compliance with the firearm and the skills of the armiger. The show is really compelling and the scenic presence is incomparable. Every single aspect is realized with the maximum precision and with the proper caution: from the loading to the single shot along roads, or as an alternative, the firing group on the squares. 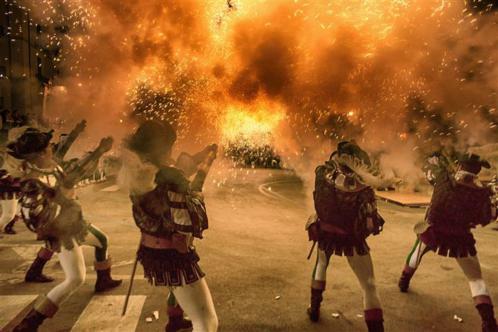 There is even the final surprise: the “bomb”, an explosive emotion to the spectator. 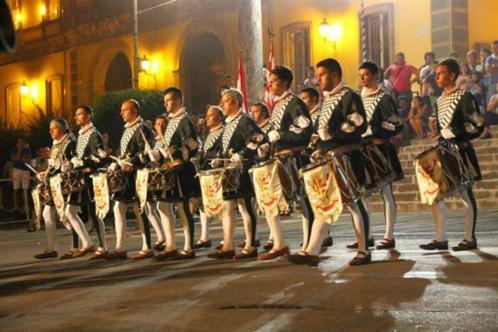 The musical team consists of trumpets with four different tonalities, snare drum players and of kettledrums with different tonalities: music, written in one’s own hand and inspired by the historical tradition, or entirely taken from the classical compositions, becomes the soundtrack of the whole show, highlighting the main moments: it heads the parades and accompanies the armiger’s marches and the performance of the group. The female beauty of the standard bearers, who show the royal banner, the synchronism and the coordination of the movements, scanned by the drum roll, offers moments of great show both in narrow areas and in wide ones (e.g. the stadium). 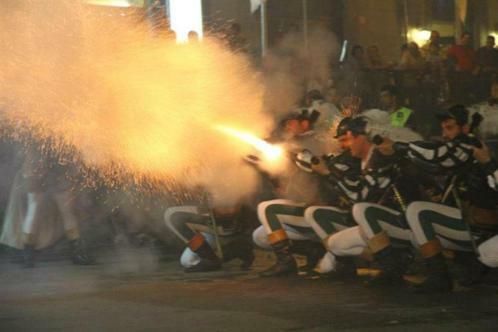 All the performed choreographies recalls the military art of that period, conveniently revised and readapted. 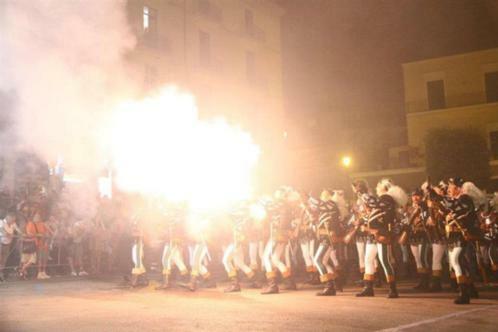 In 2014 Pistonieri Santa Maria del Rovo were rewarded for the best choreography, during the “Settimana Rinascimentale” (Renaissance week) in Cava de’ Tirreni, gaining the craved trophy “Città Fedelissima”. The standard formation is made up of 48-54 members, among Pistonieri, Drummers and the Standard bearers. 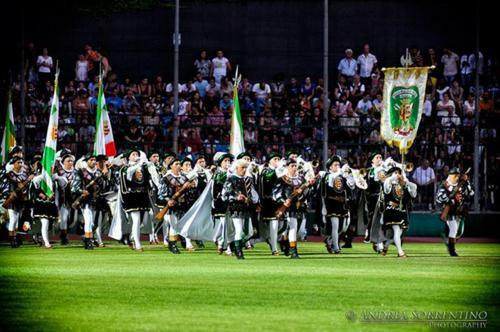 For particular needs it is possible to outnumber 100 members and it is also possible to involve in the performances other relevant associations. 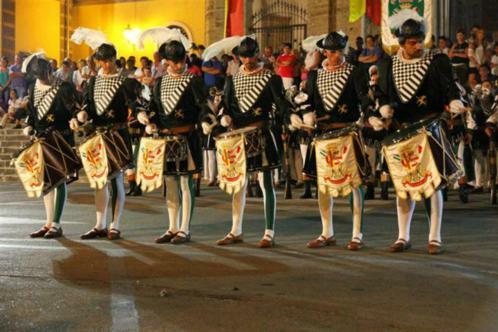 The alternative formation, made up of 10-35 elements, generally is not characterized by the presence of the armigers and it realizes, through a long-lasting and scrupulous training, brilliant and independent performances, according to features relevant to the event. 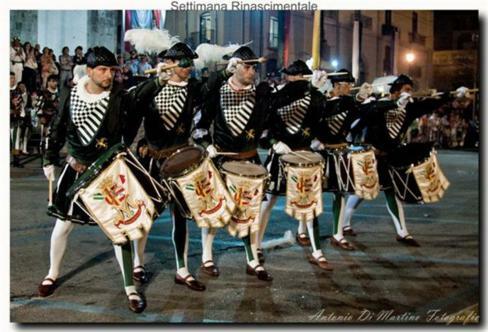 In that case, the show is entrusted to the Drummers, both Trumpeters, snare drum and kettledrums players, alongside the standard bearers, the costumed parades, dressed with costumes of that period. According to particular needs of the performance, it is also possible to personalize the features of the participating group. 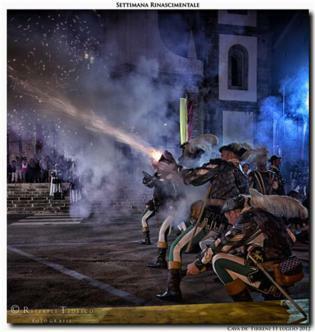 The association takes part in two different reminiscent moments of the city, belonging to two different historical periods: the Middle Ages and the Renaissance. 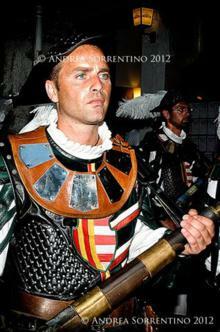 Therefore, costumes vary according to the performance in which the association takes part. 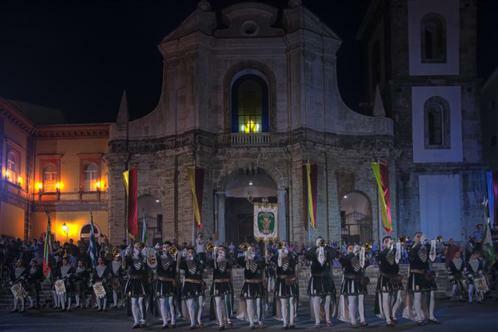 The interested period covers a time period from 1400 to 1600. The costumes worn are finely sewn by hand and are made with precious velvet and leather. 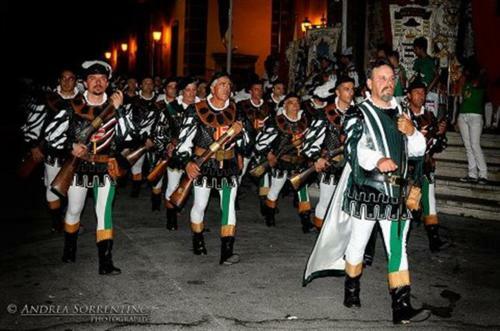 Rigorously recreated through the use of materials of that period, these costumes reconstructs in accordance with the costumes of that period, according to the available historical documentation and are enhanced with belts and shoes in leather. 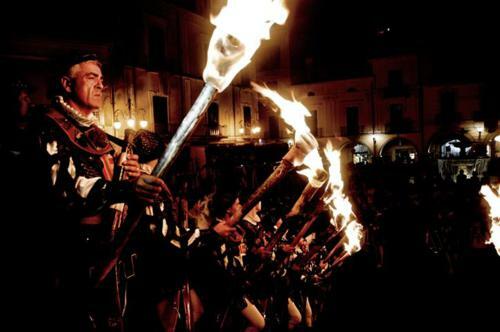 Drums are in wood, the trumpets in brass, whereas halberds are a faithful reconstruction of the original parades; they have wrought iron spears and shafts are in decorated wood. The heraldic coats of arms and the signs identify the Casale and “La Città de la Cava” during the age marked by the kings of Aragon.